All too often, issues associated with student housing are discussed in silos. The concerns that arise in one municipality are often not recognized as a part of a larger trend across Ontario. This can be attributed to the uniqueness of each individual community, and may be due to the fact that a solution for one may prove to be insufficient for others. This in turn greatly disadvantages student populations seeking short-term rental accommodations, resulting in issues such as illegal lease clauses, poor housing conditions, and inordinately high rental costs. The Ontario Undergraduate Student Alliance (OUSA) has identified the lack of municipal enforcement, and believes that the provincial government has a role to play in preventing persistent housing issues. Here at Queen’s University, the Alma Mater Society has been working in conjunction with OUSA to combat the issues that overwhelmingly affect students. This has manifested in tenacious advocacy to the provincial government. In 2015, OUSA introduced their first issue of Habitats, a series of case studies on municipal level matters that affect undergraduate students. Through this outlet, commonalities in student vulnerability were realized, and further platforms for advocacy formed. It was clear that a provincial response to these predominant issues was necessary. This resulted in the development of OUSA’s inaugural policy entitled, Housing, Transit, and Community Development, in 2017. This paper aims to illustrate the problems that students identify in their municipalities. Nearly a year after its introduction, students saw a clear response from the provincial government. Earlier this month, the Government of Ontario launched a new standardized lease that will cover all new lease agreements signed after April 30th, 2018. Under a provincially-mandated standardized lease program, all new lease agreements for rental housing must use a universal template that is set out by the provincial government. The purpose of a standardized lease is to combat illegal provisions that are often found in lease agreements. As a result, there will be no variability across different lease agreements, which will ensure that all tenants and landlords will be compelled to follow the same set of expectations. Currently, landlords are not bound to use any template for their leases, which has led some landlords, intentionally or not, to incorporate illegal clauses into their lease agreements that are not binding or enforceable under the Residential Tenancies Act. Examples of typical illegal lease clauses include the prohibition of pets, not allowing visiting guests or additional occupants, requiring tenants to pay additional deposits that are not permitted under the Residential Tenancies Act, and requiring tenants to pay for repairs that are the responsibility of the landlord. Although tenants are not obligated to abide by any illegal provisions set out in their lease agreements, many student tenants are unaware of this reality, and have been operating under a false assumption that they must abide by these stipulations without question. Oftentimes, student have followed illegal lease provisions out of fear of being penalized or evicted. A new standardized lease will ensure that all tenants, regardless of their understanding of the Residential Tenancies Act, will not be pressured into abiding by illegal terms presented in a lease agreement. 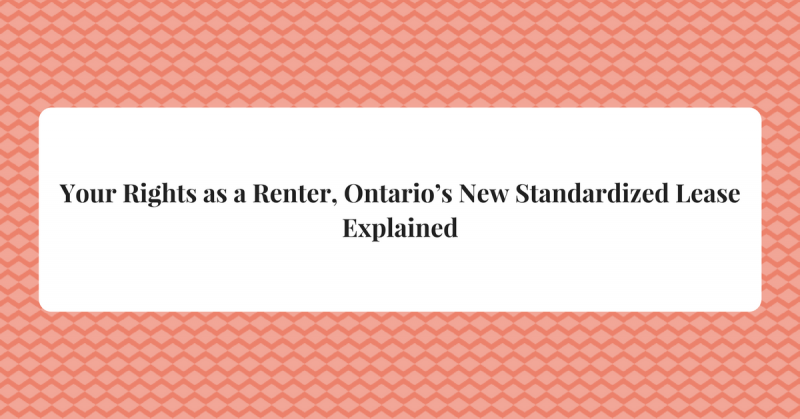 Ontario’s new standardized lease is presented in clear language that is easy to understand for both landlords and tenants. The rights and responsibilities of all parties will be clearly defined and will have no situational variability. In mandating the utmost consistency among lease agreements across the province, student tenants can be assured that their rights will not be violated by misinformed, and sometimes predatory, practices. You can download a copy of Ontario’s new standardized lease here. Stefano Hollands is the Commissioner of Municipal Affairs at the Queen’s Alma Mater Society and Victoria Lewarne is the Commissioner of Academic Affairs and an OUSA Steering Committee Member.